SMALL-scale miners in Benguet are imploring President Rodrigo Duterte to overturn his decision in banning small-scale mining in the Cordilleras. Fernando Mangili, of the Benguet Small Scale Miners (BSSM) said the clamor comes from over 25,000 small scale miners in the region who are dependent on mining as their primary livelihood. Mangili said mining is a tradition amongst indigenous peoples in the region and is one of the top economic contributor in Benguet province. Mangili said the tragedy that struck Itogon during the onslaught of typhoon Ompong was not the fault of the small scale mining industry. Santos Mero, vice chairperson of the Cordillera Peoples Alliance said DENR’s order for the closure of small-scale mining tunnels has gravely affected more than 40,000 small scale miners in Itogon, along with their families. Mero added even Benguet Corporation Incorporated (BCI) has turned small scale mining as an added source for profit. BCI’s contract scheme with small scale miners whereby at most 70 percent of small-scale miners’ profit goes to the company which has been opposed by the local people of Itogon since 1996. 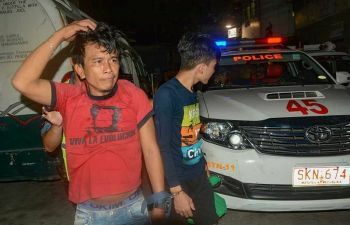 “In fact, most of the settlers in First Gate, part of the area that was buried in the September 2018 killer landslide were contract miners of BCI who had no security of tenure, no security of shelter, and no protection from the company or just compensation for workplace mishaps,” Mero said. Mero added BCI’s promise of rehabilitating Itogon, which never happened, must be pushed and implemented the soonest time possible. For without adequate rehabilitation of the mined-out areas, disasters such as massive landslides and ground subsidence are inevitable. If the company, which has been raking profits for over a century, is truly sincere in caring for the people of Itogon and the environment, it must spend its own money for the rehabilitation of the area without having to continue any profit-making schemes that entail continuity of mining. At the least, it should backfill its underground tunnels, clean up Agno river and other rivers, provide just compensation to damaged properties of the people, do reforestation, release to the public a copy of its underground tunnels map,” he added. Mero pointed responsibility to BCI saying the September 2018 mining disaster in Itogon is another testament that responsible mining is a myth. “The experience of Itogon, which is no different from that of the communities affected by Lepanto mining and Philex mining operations, must not happen in any other areas in the region. Large-scale mining applications in the region, which now reached more than 100 applications including the mining project of the Cordillera Exploration Corp. Inc. (CEXCI), must be withdrawn. This is especially so at this time of extreme weather conditions such as heavier rainfall and stronger typhoons as a result of climate change, making the Cordillera soil even more prone to landslides and flooding,” Mero added.